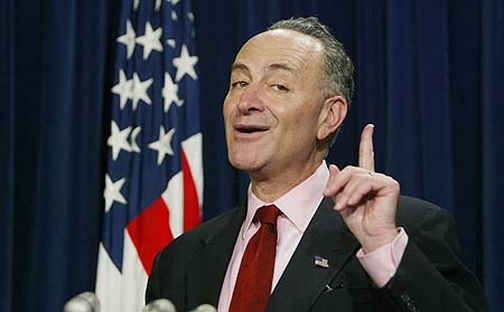 Shortly after the Cybersecurity Act gained Senate approval to proceed to filing proposed amendments and a vote next week, Sen. Chuck Schumer (D-N.Y.), a sponsor of the gun control amendment, came to the floor to defend the idea of implementing some “reasonable” gun control measures. The amendment was sponsored by Democratic Sens. Frank Lautenberg (N.J.), Barbara Boxer (Calif.), Jack Reed (R.I.), Bob Menendez (N.J.), Kirsten Gillibrand (N.Y.), Schumer and Dianne Feinstein (Calif.). S.A. 2575 would make it illegal to transfer or possess large capacity feeding devices such as gun magazines, belts, feed stripes and drums of more than 10 rounds of ammunition with the exception of .22 caliber rim fire ammunition. The amendment is identical to a separate bill sponsored by Lautenberg. Feinstein was the sponsor of the assault weapons ban, which expired in 2004. The proposed amendment would only affect sales and transfers after the law took effect. Schumer defended the Brady law and assault weapons ban on the floor Thursday evening, perhaps in preparation for the coming fight with Republicans and gun rights activists. Schumer suggested that both the left and right find common ground. “Maybe we could come together on guns if each side gave some,” Schumer said. He suggested that Democrats make it clear that their goal is not to repeal the Second Amendment. Schumer also pointed out that it would be reasonable for the right to recognize that background checks on those buying guns is necessary — as called for in the Brady law. He also said average Americans don’t need an assault weapon to go hunting or protect themselves. Next week the Senate is expected to debate and vote on proposed amendments to the cybersecurity bill.